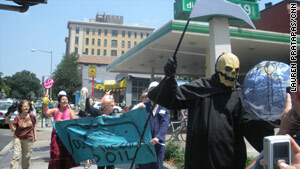 Protesters, including a "Grim Reaper" who poured syrup over a globe to symbolize oil ruin, were out Saturday. Wilson says, "This country needs to get behind the Gulf Coast"
Wilson: "You have to go out and do these outrageous actions"
Washington (CNN) -- Diane Wilson, arrested during a Senate hearing on the Gulf oil spill, protested again Saturday outside a BP gas station in Washington. She and more than a dozen other protesters chanted "boycott BP" while a man dressed as the Grim Reaper poured chocolate syrup over an inflatable planet Earth to symbolize the oil destruction. "I think this country needs to get behind the Gulf Coast. We are all in this together," Wilson told CNN. "It is like a body. If you got your foot being amputated, by gosh the rest of the body better take notice or we are all going to go down," said Wilson. She was arrested Wednesday after dumping fake oil on herself during a Senate Energy and Natural Resources Committee hearing on the spill. She was in the audience when she began her protest and she was removed from the hearing room. "After doing this for 21 years, being nice, writing a letter, sitting down and talking to your congressman doesn't hack it," said Wilson, a fourth-generation shrimper from the Texas Gulf Coast. "You have to go out and do these outrageous actions." Saturday's protest drew little response. Customers continued in and out of the BP gas station, and the station's lone employee on duty had no comment.